1/12/14: The second 4 player 80 point game was played. 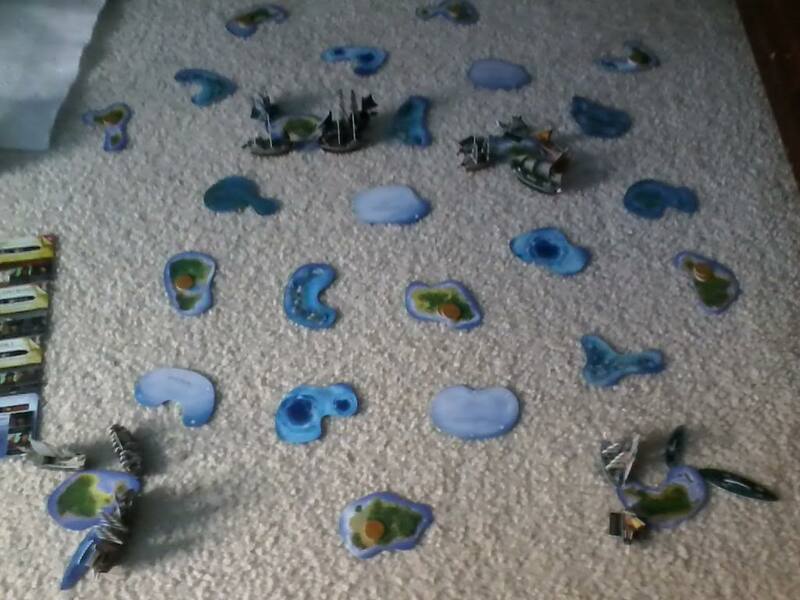 The fleets would go in reverse order from the last game: first the Americans, then the French, English, and Pirates. 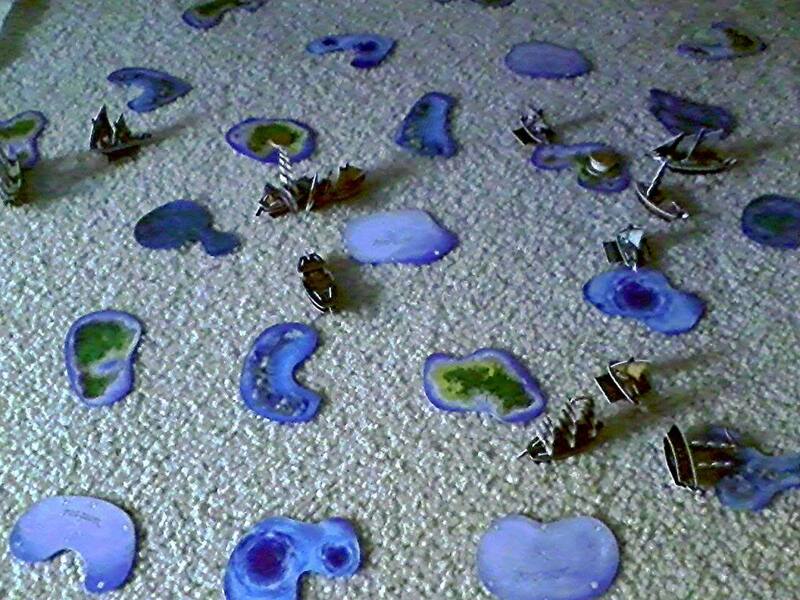 Terrain was used, although it unsurprisingly was not a factor. This shows the sea just before the game started. Clockwise from the upper left, you can see the Pirate, French, English, and American home islands. The Frontier and Triton were the first ships to explore islands. The Pirates immediately went after the Americans, with an extra action from Gallows on the Queen Anne’s Revenge taking a mast off the Nene Nui. The Paladin responded with an extra action of her own, dismasting the Revenge, letting the Nene Nui explore her island. The Frontier explored the island that the Triton previously explored, while the Triton brought back the one coin from it that she could carry. The Tunis and Belle Poule explored islands for the French. The English were also wary of the success of the American fleet. The Lord Cauldwell rammed the Frontier, while the Algiers tried to hit the Frontier coming out of the fog. The die roll made her come out on the wrong side, however, so the Algiers would have to wait. The Pirate ship Obago would now dismast the Frontier, while the Royal Rover sailed up and took two masts off the Paladin. However, the Americans were able to salvage part of their situation. The Paladin used another extra action to sink the Queen Anne’s Revenge with one move action, and dock home safely with the next. The Nene Nui ducked into a fog bank to escape further harm. At this point, the USS Mercury decided to showcase her considerable power. After coming to the surface, she hit the Obago twice (including once with a firepot) and rammed off a third mast, not to mention using her 2L guns to take a mast off the durable Lord Cauldwell. HMS Algiers now towed the Frontier and connected for a hit on the Mercury. The Pyre (in the English fleet) rammed the Obago derelict. 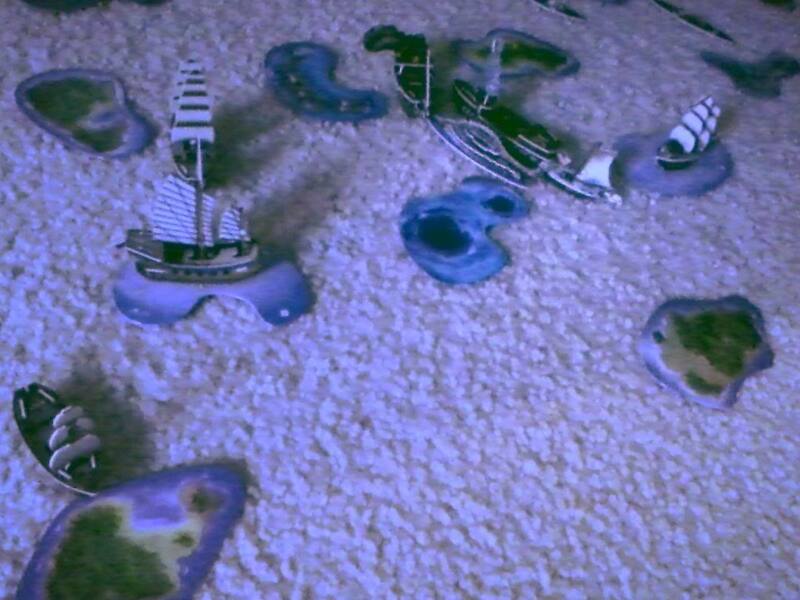 From left to right: the Paladin repairs at the American HI, the Nene Nui avoids the Royal Rover by going into a fog bank, and the battle between the Pirates, Americans, and English rages on as the Mercury enters the fray. In other action, the Baionnette and Triton had explored the same island for the French. The Locker missed the Triton with her guns and ram attempt, but managed to win the boarding party and thus eliminate all four crew aboard the Triton. In the meantime, the Royal Rover dismasted the Mercury (for the first time ever) and began towing her comrade, the Obago, who managed to put out the fire. The Nene Nui docked home 3 gold coins for the Americans while the Paladin repaired. To the north, the SCS Santa Lucia dismasted the Swift with her firepot specialist, but the Swift was in S of her HI and put it out on the next turn by rowing home. The Belle Poule and Tunis brought back more gold for the French. The Triton and Baionnette went a combined 1 for 4 against the Locker, who responded on her next turn by hitting the Triton and trying to ram the Baionnette. The English forgot that the Baionnette’s masts can’t be eliminated by ramming. The boarding party against the Baionnette ended in another four French crew being eliminated, but despite the power of this ability, it would not help the English much in these games. Continuing the English vs. French rivalry, the Pyre rammed the OE Santa Lucia just as she was looking to steal gold from the HI of the Pirates (especially since the Swift was derelict and wouldn’t be able to defend the gold she had brought back). The Pyre would then surface to actually shoot at the Santa Lucia, but she missed both times. The Royal Rover dismasted the Lord Cauldwell, and used Blackbeard to capture the English captain aboard the Cauldwell, to be turned into gold if the Rover could make it to her HI. Making the plight of the English even worse, the Baionnette and Triton finally outlasted the Locker and sunk her to the bottom (to Davy Jones’ Locker!). The Pyre would now be dismasted by the SCS Santa Lucia and sunk by the Royal Rover. On the next turn, the Paladin sunk the Lord Cauldwell. The Algiers did manage to bring back the captured Frontier, giving them 5 gold coins, a huge amount for a fleet with just one treasure runner (the Patagonia brought back just one gold for the whole game). At this point, the game was winding down. The Swift was fully repaired. The SCS Santa Lucia created more problems for the Pirates by ramming the Royal Rover and taking the captured English captain for herself (unaware that captured crew that had already been captured would not be worth gold unless the capturing ship also had the ability that Blackbeard has). The Rover promptly rammed the Santa Lucia and stole the captain right back! The Paladin used an extra action to dismast the Algiers, who was going back out after bringing home the Frontier, giving the Americans some level of satisfied revenge for the English taking their prized gold ship. Up north, the Nene Nui took the last coin off the last wild island. The Swift hit the Nene Nui twice, leaving her with one mast. In an odd coincidence, the Belle Poule, Baionnette, and Triton all came home with gold for the French on the same turn. The Swift hit the Nene Nui twice more on the next turn, sinking her to end the game. Here’s the action just two turns before it was all over. To the left, the Swift approaches the Nene Nui. The Santa Lucia has set the Royal Rover on fire, while the Rover abandoned the Obago to fight the Spaniard. The French are about to dock their final treasure coins, while the Paladin has dismasted the Algiers just north of her home island. The French managed to largely stay out of the matters of the opposing fleets, and they were lucky that none of their designated treasure ships was sunk on any of their gold runs. The English would have finished last once again if not for their capture of the Frontier. I’d like to do the next game of this 80 point series tomorrow.